The Rocky Mountain Institute, World Resources Institute and the city of Minneapolis on Tuesday announced the formation of a new group designed to help municipalities procure more renewables in the next two years. The program is based on RMI’s Business Renewables Center, which helps corporations buy more renewables. The new program, called the American Cities Climate Challenge Renewables Accelerator, targets 2.8 gigawatts of renewables being deployed by cities nationwide by 2021. It’s part of a greater $70 million initiative spearheaded by Bloomberg Philanthropies to encourage climate action at the municipal level. Organizers say the programs are another attempt to provide local leadership in the wake of federal inaction on climate change. Read more here. Power Association. 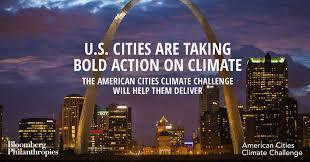 Several public power cities were winners in American Cities Climate Challenge. This entry was posted in NewsBlog and tagged American Cities Climate Challenge, American Cities Climate Challenge Renewables Accelerator, Bloomberg Philanthropies, RMI’s Business Renewables Center, Rocky Mountain Institute (RMI), U.S. cities' climate action, Urban Sustainability Directors Network (USDN), World Resources Institute (WRI) on February 26, 2019 by Helen Deffenbacher.